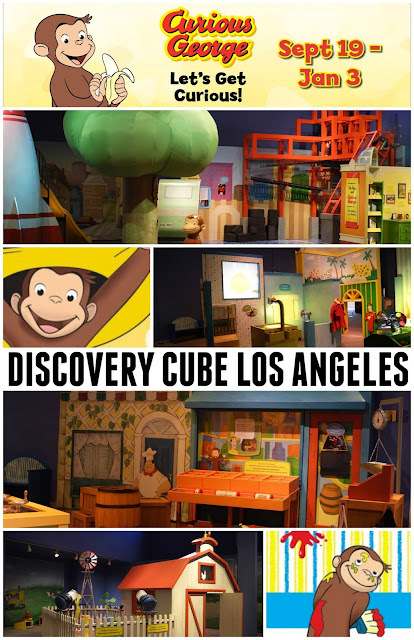 Bring your children and their insatiable curiosity to Discovery Cube Los Angeles this fall for a new exhibit, Curious George: Let's Get Curious featuring everyone's favorite monkey! "George is a little monkey, and all monkeys are curious. But no monkey is as curious as George." Starting September 19, 2015 and going through January 3, 2016 families are welcome to exercise their curious minds while they explore the neighborhood where Curious George and The Man with the Yellow Hat live. Did you know that the authors of Curious George saved the manuscript during World War II. There's a lot more to learn about this curious little monkey and you can do it all at The Cube. This classic story has captured the heart of millions for 65 years and now thanks to Discovery Cube LA it will be introducing this historic little monkey to a new generation of kids. I am really looking forward to seeing one of my my childhood literary favorites come to life and sharing it with my children. Stay tuned on my blog for the upcoming review and recap of this adorable exhibit. Photos and images featured in this post are courtesy of Discovery Cube Los Angeles.